I grew up thinking of duct tape as a wheel of sticky, silver tape people used to fix things. Especially car upholstery. How many times did my thigh get stuck on a strip of tape peeling up from the bench seat of a Buick? Flash forward a few decades, and my pre-teen daughters consider duct tape a staple of their craft bin. They’ve been fashioning purses and belts and flowers and hair accessories from duct tape for months. Make that years. And this is not your father’s duct tape. I’m not even sure we own a roll of silver tape any more. We have blue and neon green and hot pink and God knows how many funky patterns. Naturally, today’s make something prompt called for a 3-D duct tape creation on a day when my little crafters are with their dad. So instead of my in-house instructors, I had to turn to Google for advice and inspiration. The fine people of Duck brand duct tape have capitalized on the adhesive creativity craze by providing crafting tutorials. I liked this gift bow. And since one of my crafty daughters will turn eleven this coming week, I know I’ll be able to use it. How does this relate to my theme of “words”? Well, the gift I plan to top with this funky bow is a book! Better yet, it’s a book Hannah and I will write together: Just Between Us: A No-Stress, No-Rules Journal for Girls and Their Moms. Perfect. But don’t tell Hannah. 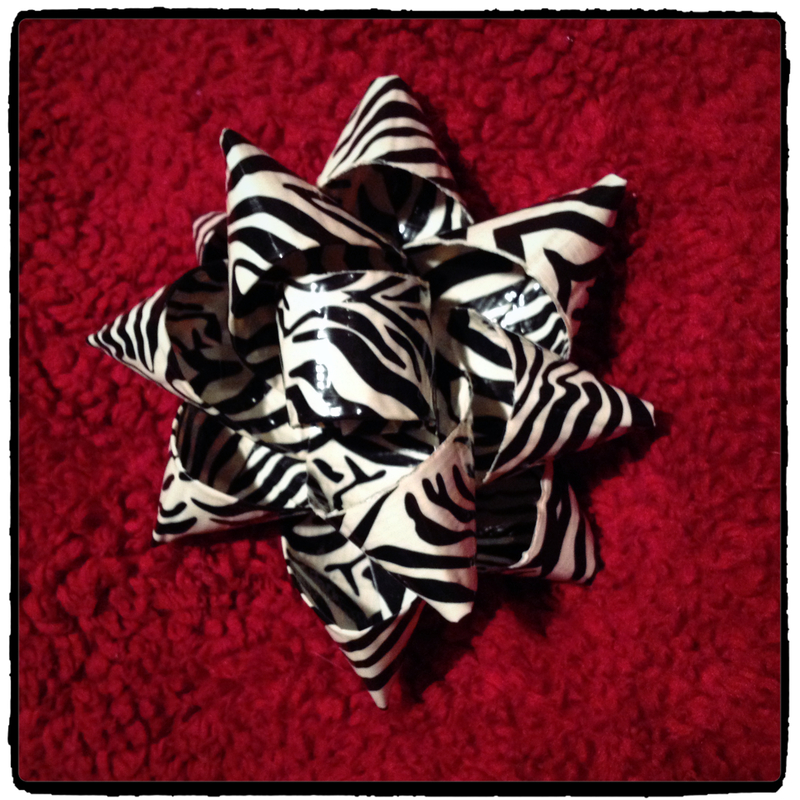 I want the book—and the zebra-print bow—to be a surprise.